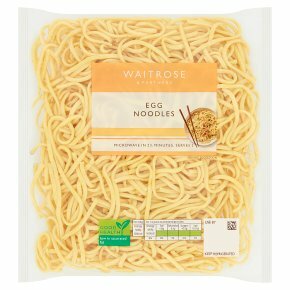 INGREDIENTS: cooked free range egg noodles (94%) (fortified wheat flour (wheat flour, calcium carbonate, iron, niacin, thiamin), water, pasteurised free range egg, salt, firming agent (potassium carbonate, sodium carbonate), acidity regulator (citric acid), turmeric, paprika), water, rapeseed oil, spirit vinegar, salt, cornflour, sugar. Heat dry wok for 2 minutes. Add 1 tsp oil and noodles. Stir fry for 3 minutes until piping hot. Serve immediately. Do not reheat once cooled.